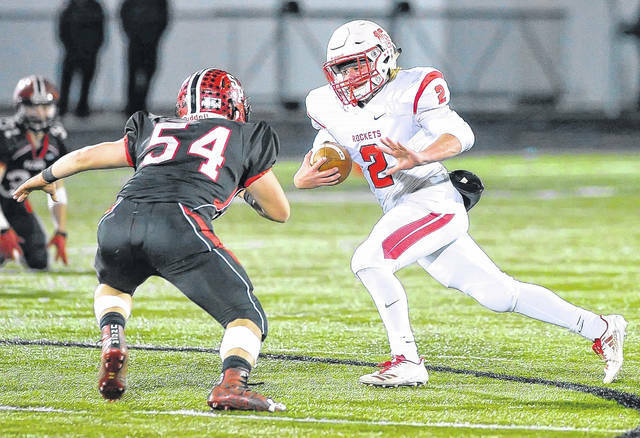 Pandora-Gilboa’s Peyton Traxler was the Rockets’ leading rusher last year and returns for his senior season. SEASON OUTLOOK: We are very fortunate to have a great senior class that not only has tremendous players but also great leaders. If we can avoid the bug and play to our potential then I believe we have the ability to have another great year and contend for a BVC championship. Aug. 24 at Columbus Grove 7 p.m.
Aug. 31 Cardinal Stritch 7 p.m.
Sept. 7 at Vanlue 7 p.m.
Sept. 21 Van Buren 7 p.m.
Sept. 28 Arcadia 7 p.m.
Oct. 5 McComb 7 p.m.
Oct. 12 at Cory-Rawson 7 p.m.
Oct. 26 Riverdale 7 p.m.
PANDORA – Pandora-Gilboa head coach Matt Hershey does not want last year’s magical run in the playoffs to be a one-year thing. The Rockets made it to the regional finals before bowing out to Norwalk and Hershey is hoping to continue those winning ways this year. Nine returning letters winners return from a team that went 10-3 overall last year but it will be promising newcomers to fill the holes left by a talented senior class. “I think early on we kind of expected to be good again which is not a terrible thing but we had to reteach how to work hard again and how to do things the right way and that fight for them to want to get better,” said Hershey who enters his second year as the head coach. Hershey added that winning last year has bolstered offseason weight training attendance and that is an encouraging sign. Senior signal caller Jared Breece returns to guide the offense and is joined by running back Peyton Traxler, receivers Riley Larcom and Tyler Magg and linemen Isaac Stall, Zebulon George, Austin Niese, Gage Hovest and Brennen Morman. Breece, the All-State quarterback and co-offensive All Northwest District player of the year, passed for 2,133 yards and 28 touchdowns and ran for 821 yards and 12 touchdowns. Also returning is top rusher, Peyton Traxler who gained 875 yards and 12 touchdowns. Magg and Larcom return at the receiver positions and the duo combined for 57 catches for 1,002 yards and 13 touchdowns. “Travis Maag was a big play receiver and Riley Larcom is going to be our go-to guy,” Hershey said. Defensively, the Rockets return six of their front seven players. Maag returns as the team’s leading sack leader with 11 and Zeb George and Gave Hovest are going to fill out the rest of the line. All three linebackers also return with three-year letter winners Larcom and Austin Neese manning the outside spots and Isaac Stall, who led the team in tackles with 68, will man the middle for the Rockets. “We are hoping our front seven can really put pressure on the quarterback and contain the running game to help our secondary which will be our youngest group,” Hershey said. Expect sophomores Bryce Basinger and Silas Schmenk to contribute in the defnsive back field, along with junior Walter Macke in the mix who Hershey describes as the team’s “swiss army knife” who will get some touches on offense. Breece will add some veteran stability in the defensive backfield. “We got a little experience back there with some brand new guys so hopefully the front seven can help those guys while they grow up a little,” Hershey said. Last season, the Rockets defense gave up 230 total points and recorded 20 interceptions. Other newcomers expected to be vying for playing time are Dillan Krohn, Austin Miller, Blake Steiner, Sam Burkholder, Gavin Biery and Dylan Bryan. With a nice blend of veteran leadership and promising talent, Hershey expects to have a similar year as last year and hopefully capture that elusive Blanchard Valley Conference title. “Our goal is to win a BVC championship,” Hershey said. “We have not done so since 1999 and we were one game away from doing it last year so that is still our goal. It is still a lofty goal. Second. We want to go to the playoffs. We didn’t win the BVC but we made a nice little playoff run and that is a pretty good consolation prize. This entry was tagged High school football preview 2018, pandoragilboa. Bookmark the permalink.